A captivating story that will keep you guessing till the very end. The ending definitely leaves you hanging, and you'll hate that you have to wait for the next book to find out what happens next. R.A. Salvatore provides plenty of thrills and surprises in his latest book, Archmage. The book features Salvatore’s most popular character, a drow ranger named Drizzt Do’Urden who has abandoned the backstabbing ways of his brethren for a life lived with honor and a hefty does of heroics. Drizzt, reunited with his old friends the Companions of the Hall, seems to have everything he wants as the book begins. The darkness and war that had covered the North has been dispelled, and peace and connectedness has come to the dwarf kingdoms. But alas, peace is not to last, and Drizzt is suddenly not as fulfilled by his life of adventure as he’d been in the past. As Drizzt’s thoughts turn to a life beyond the endless battles and adventures, many old friends fall in a frenzied fight for an ancient homeland. Reincarnated dwarf king Bruenor is determined to reclaim Gauntlgrym, the ancestral home that has been overtaken by drow. The home and its unparalleled primordial forge is a symbol of how powerful the dwarves once were – and will be once again. Drizzt stands by his old friend, determined to help him win his fight, and many powerful allies of old join them in their quest. But as always, Drizzt has a lot going through his mind, the foremost being whether his life of battles and adventures is all he wants. Could it be that the unstoppable Drizzt is finally ready to slow down? 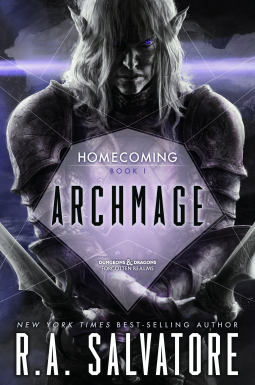 Archmage is a book filled with much that long term fans will expect – of course Bruenor would fight to free the homeland, the drows would continue their relentless fight to slay Drizzt, Gromph will scheme, and Lolth will do her utmost to create the pinnacle of chaos (and quite successfully too). But there is also much that is unexpected – after all, the drow are ever unpredictable, and chaos is sort of their thing. Though there is a lot of back story involved in getting Drizzt to this point in his life, there is enough overview given to keep even complete newcomers to the story engaged in Drizzt’s quest. Reading the books that have come before does give readers a greater understanding of what’s at stake with all of the characters, but Archmage provides a story that can stand on its own (though it may well have you scrambling to go back and read the others once you’re invested in Drizzt’s story). 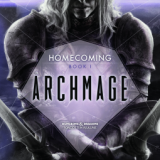 With Archmage, fans both old and new will find themselves shocked, enthralled, and above all – entertained.